Leaving Long Island was like leaving the last piece of the modern world. We left on a day with light winds, so we would use as little fuel as possible getting into wind and waves, all the way to Rum Cay. By staying a little bit off course, we were able to get some use out of the main sail. This is called motor sailing. Big was our surprise, when all of a sudden the wind changed direction a bit and picked up. It was blowing between 15 and 20 knots and we soon found ourselves putting a reef in the main sail, making its surface smaller. Who would have thought? Even though this situation was not predicted and white caps were surrounding us, we felt fortunate enough to all of a sudden be able to sail, and we took full advantage of that. The fun lasted about two hours. Then, the wind became “normal” again and we motor sailed the rest of the 44 miles. We decided to skip beautiful Conception Island, in order to make some progress at last. Whenever we turn back north, this will be one of our stops! 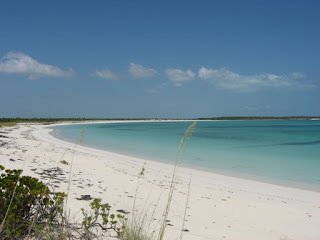 The anchorage of Rum Cay, with its clear water, is partly protected by reef, and was quite comfortable for us, thanks to the light winds. Our shallow draft allowed us to tuck in closer to the reef than most of the other boats, giving more protection. Sometimes it’s great to have a catamaran! The quiet town itself was nothing much. After being attacked by hundreds of mosquitoes, it lost its charm pretty quickly. 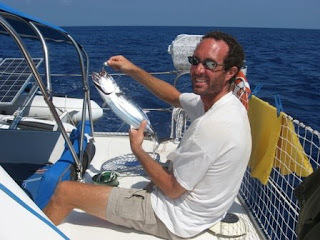 Mark had read in an old cruising guide that the marina owned a fancy restaurant with a great Japanese cook. He decided to treat. When we found the restaurant, it appeared closed. It would be possible to open for us for dinner. We didn’t want them to bother, especially not after hearing the menu existed of frozen meat patties… So, we had a drink instead, together with another cruising couple (not Cindy and Gray, we actually lost track of them and wondered where they were…) and tons of blood sucking insects. They even found their way in the boat at night, making us wanting to leave the following day. The next leg was 80 miles and the longest trip (in distance) we did so far. It would bring us all the way to Atwood Harbour in the Acklins and because of its length, we had to travel at night to be able to leave and arrive in daylight. 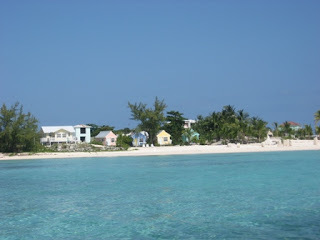 After the necessary preparations and rest, we left Rum Cay around five in the afternoon. While dodging the hard to see coral heads, we decided this departure time was really too late, especially since we were headed into the setting sun. Note to ourselves: only leave funky places between 10am and 3pm! We got out OK and reached safe water half an hour later. The motor trip to the Acklins was mostly uneventful. It was blowing just under ten knots, making the waves small enough to stay comfortable. We picked a good time to go. Mark and I took turns and even the dogs managed to get some sleep. The only annoyance was that we were really moving dead into the trade winds and the sail became useless unless we bore off course a bit, which we ended up doing. We didn’t want to get to Atwood Harbour too early anyway. We needed to see the big reef on both sides of the entrance to the anchorage. 10 am proved to be a decent time to see all the obstacles and to take in the great view of this beautiful and remote bay. 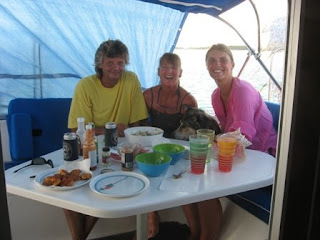 Little later Irie was settled, the dinghy taken down, the motor installed, and the dogs taken to the white, long beach. The water had an interesting green colour which we were not used to anymore. Still very pretty, though. Atwood Harbour pleased us a lot. So much that we ended up staying four days. During those days (after sleeping the first one), we played with the dogs, took baths and swam in the cool water, made walks on the nice beach, and relaxed on the breezy boat. On the second day we got company from a very interesting Austrian couple and their awesome home made catamaran. (Still no sign from Cindy’s Island…) We got to meet the crew of Renegade and spent two evenings with them, exchanging stories, sharing food and taking tours in each other’s cats. They had caught a huge 50 pound tuna on their way over and gave us a couple of fillets. They also shared a whole plate of raw strips. Imagine that: eating fresh sushi (with soy sauce, wasabi and ginger!) on your own boat… That indeed, was one of our culinary highlights so far. We had found a lot of conch the previous day and turned all that fresh meat into a big conch salad and delicious conch fritters! What a delicious evening that was!! Before the weather would turn against us, we made the hop to Mayaguana, 50 miles down the road. The distance is a little tricky (long) to do during the day, but we managed to keep up about five knots, under one motor and the sail, bringing us to the east coast of the island by 5:30 pm. Later than we’d like, but there were no obstacles, since we were basically anchored in the ocean. Luckily, the swell stayed down and we actually had a good night sleep. The beach was nothing pretty, but it was a good place to take the dogs, there were a lot of pretty shells and even a real dog toy, found by Kali. Oh, and guess what we caught on the way over there? A small tuna! Our first real fish. We got three meals out of it and two bites of sushi. People and guidebooks talked about moving to Abraham’s Bay, a more protected harbour and a town, before leaving Mayaguana. We didn’t think much about it and followed everybody’s lead, the next day. 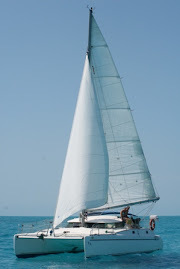 A big mistake… To get there, we actually sailed (yes, with just our sails!) south for an hour, before turning east again. That’s when we first encountered the real trade winds. Even though it was “only” blowing 15 knots, getting straight into that mess of head wind and big waves is all but comfortable and requires huge amounts of fuel. Luckily, we reached Abraham’s Bay after two hours of pounding. There, I stood watch on the beam (sail down of course) for another hour and a half (it’s a very big bay), while Mark carefully drove the boat. We were on the look-out for the many coral heads spread out in the clear water. It was pretty easy to go around them, but it took concentration and a long time of standing in the hot sun. Later that night, I suffered from a minor, but painful, form of a heat stroke. Obviously, this was no place to hang out and we wanted to continue on to the Turks and Caicos from the moment there was a weather window (meaning less than 15 knots of wind, we didn’t count on the wind direction changing, this is the area of the trades!). Our next crossing would have to be a night one, and there was no way we could leave from this anchorage in the dark. We soon realized why it was a mistake to come here: we were trapped!